It’s almost like we are trying to out-do each other for birthday dinners. 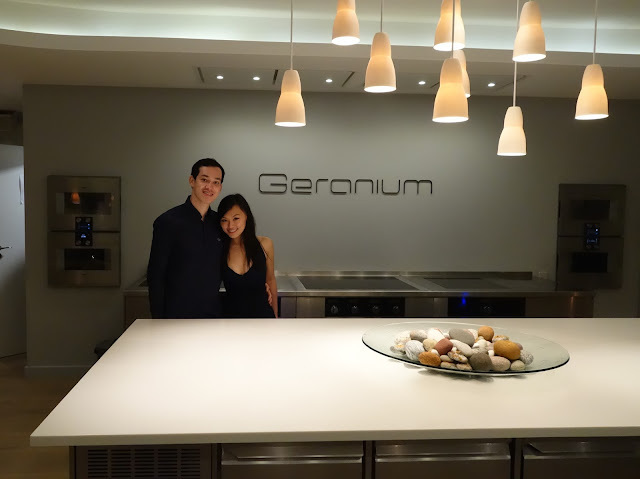 Last year he had set the bar high at Restaurant Andre in Singapore, and this year he picked Geranium in Copenhagen, No. 21 on the World’s Best. The dining room was spacious with huge windows that offered a panoramic view of the park and the stadium. Our server introduced us to their concept, checked that we had no allergies and left us to mull over the wine list. I was still admiring the beautiful dining room. We tasted a beautiful Greek wine that was meticulously prepared by the Sommelier. The seemingly simple snack was hiding a copious amount of lobster meat. Sweet, bouncy lobster flesh was paired with soft tender carrots in a refreshing thin broth. The artichoke leaves melted on tongue to release delicate sweetness and earthy notes. This was one of the signature snacks. The razor clam shell was made up of brittle wafers, filled with sweet clam meat mixed with a clean, oceanic cream. It was like a concentration of the shellfish presented in a totally edible form. This was one of my favourites of the snacks. The mackerel fillets were disguised as stones; small morsels were wrapped in a deep green dill glaze. As the shell melted away, it unleashed the powerful mackerel flavours, balanced with horseradish fragrance that cut through the fish. The sophistication in one small cube of pickled fish was remarkable. The presentation of this dish was stunning. The hake fillets were not dissimilar to sashimi, packed in a disc form that resembled marble, matched perfectly with the marble plate it was served on. 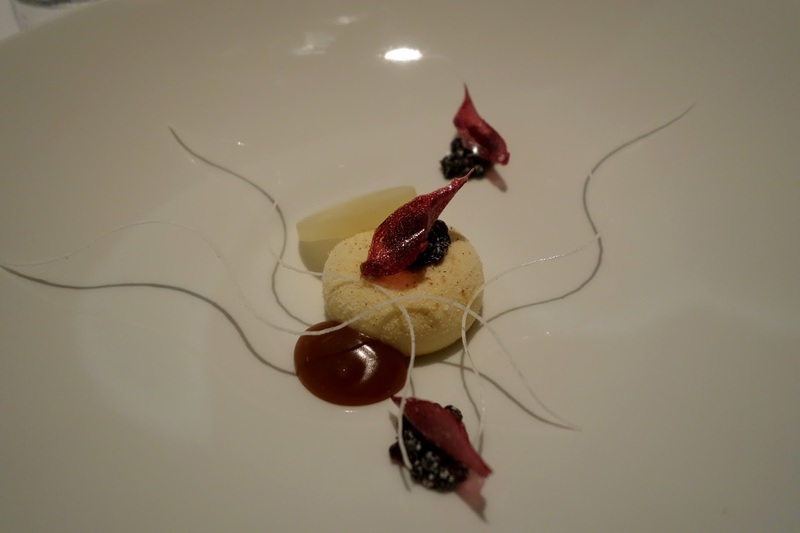 Our servers pour the buttermilk onto the disc at the table, topped with caviar and air-dried fish scales. The flavours were beautifully layered, first with the crisp cleanness from the lightly cured fish, then came the robust aroma from the caviar, which became more mellow as the rich buttermilk washed over. I loved it. One of the servers was heating up what looked like a gardening tool with a gas-powered fire on a trolley next to us. She explained this was to open a bottle of really old wine, where they can no longer drill through the cork anymore. After the metal started glowing, she place it around the neck of the bottle and the head was simply cut off in one swift motion. Learn something new everyday. The breads came in the middle of our mains, served warm with a crispy crust on the exterior and a pillow-soft moist centre. The gluten free bread was absolutely delicious, so much so that we had to have seconds. Then came the second highlight of the evening. The muscular langoustine arrived on a bed of juniper and pine leaves. 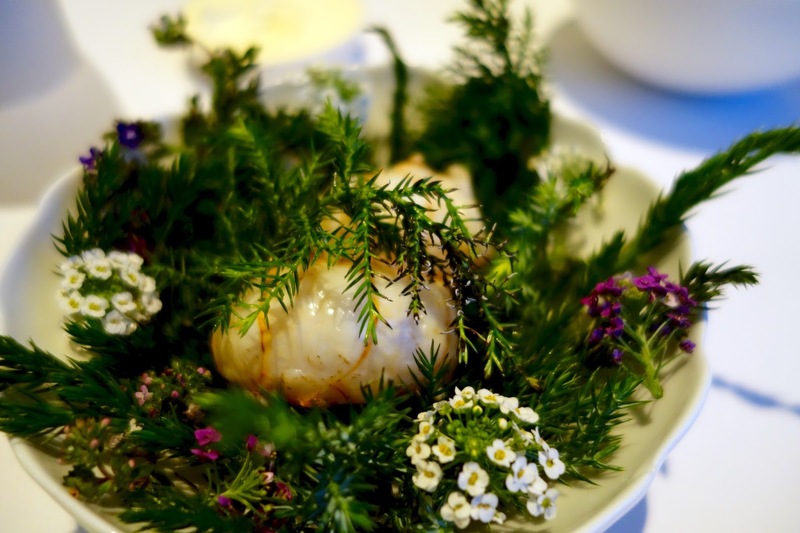 Our server lit up the bed of leaves and covered with a glass dome to infuse it with smokiness before serving it on a small pool of buttery fragrant shellfish broth. The flesh was cooked to utmost perfection; full of bounce, slightly translucent that it has a mild glow to it to retain a marginally creamy centre, its flavours were amplified by the crustacean concentration. I still have dreams about this langoustine. This was the only meat dish of the evening, and frankly Chef shouldn’t have bothered. It was really quite unremarkable, some morsels of sous vide chicken under the small stack of sprouts. Obviously it was nice, but compared to everything else we had, nice simply doesn’t cut it anymore. At this point of the meal, we were offered a tour of the kitchen and the cellar. We were shown the private dining room, also where the staff were the guinea pigs of the kitchen team. After Chef photo-bombed us, we went into the main kitchen where we were explained how the kitchen operated, saw where all the prep work took place before they put on the show in the dining room. We then had our first dessert course in the kitchen area; we watched the chef skilfully put the beetroot bite together. This was served as my birthday cake, along with a Danish flag which is apparently a must when celebrating birthdays in Denmark. Geranium was extraordinary. 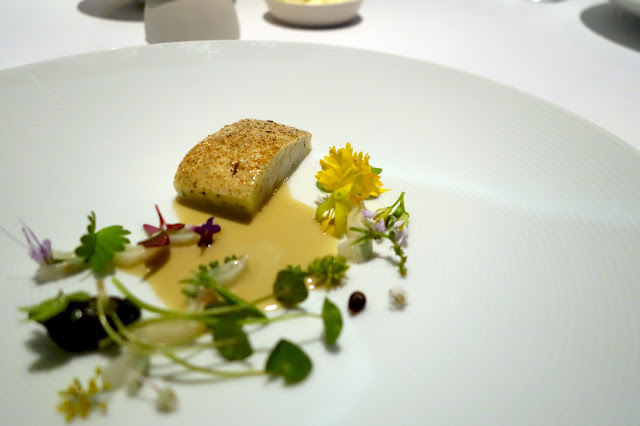 It was more than just perfectly presented dishes bursting with sophistication and finesse. It was the full experience, from the introduction to the tour, the staff had a genuine sense of pride to represent the restaurant. And they did their best to ensure we had an exceptional evening. I have a problem, what do you recommend to buy a family car?